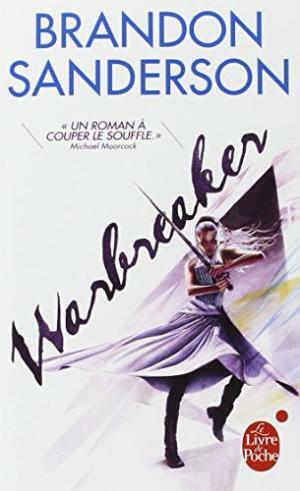 Brandon Sanderson is probably my favourite living fantasy writer, and has published some highly entertaining and multi-faceted fiction in notable series such as the Way of Kings, but with all these successful series can we guess why Warmaker is a standalone novel? Or his debut novel Elantris for that matter? It’s not as though Warmaker lacks anything in the thoroughness of the world’s depth or texture. All the backstory, the unique magic system (involving the use of “breath”), the fascinating characters such as sisters Vivenna and Siri, the indolent Returned Lightsong and other scheming Returned that are worshiped as gods in Hallandren, along with the remote God-King, who is not all that he seems. So why write Warbreaker as a standalone? The first and most obvious guess is that this was the size of the idea. As many writers will tell you, some ideas come in short story length, other as novellas, while others have such breadth they demand the broader canvass of the full novel. The key is what is driving the story. What was that core idea, that first “wow” moment that gave the impetus for the world’s creation in the first place? For Warbreaker, I find that key idea difficult to pin down. Did Sanderson have the idea for the magic system and then create the story around it? One of the things I do love about Sanderson is the invention in his magic systems – look at the use of metals for magic in the Mistborn series. The magical sword in Warbreaker is particularly entertaining (don’t worry it’s introduced early). Or is it in the characters? The backstory does link the key villain to the royal line, of which Vivenna and Siri are scions. Was it the character development of the two princesses that drove the story for Sanderson? I guess if that was the case, its resolution would present a natural end point. Want to check out Chris McMahon’s fiction? 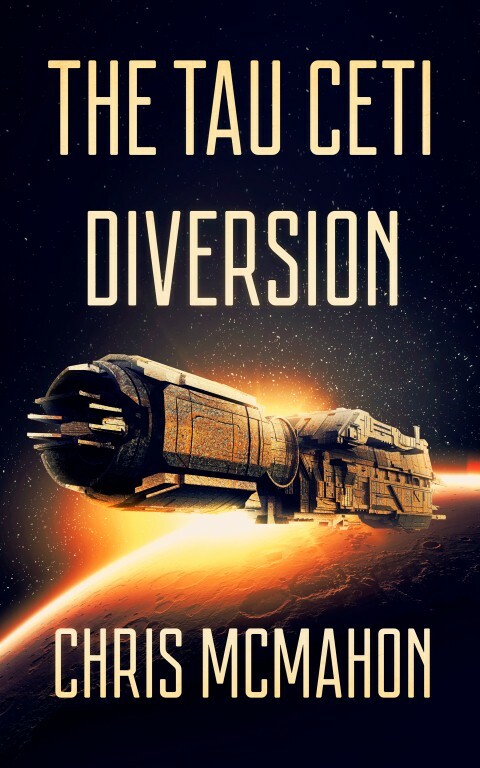 The Tau Ceti Diversion, the first interstellar exploration vessel Starburst sets out from Earth in 2157, but this is no NASA science mission, it’s funded by the mega-corporation ExploreCorp. On approach to the planet Cru, the Starburst is hit with a surge of deadly radiation that kills most of the crew and disables the ship. 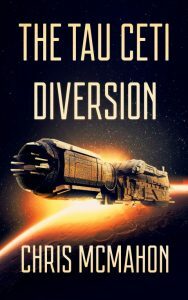 It’s a fight for survival as sub-Commander Karic struggles to get control of the fusion drive before the ship turns into a giant hydrogen bomb. In The Calvanni, first of the three-book fantasy series, The Jakirian Cycle, Cedrin, a street-wise calvanni (knife-fighter), is summoned to the secret underground tunnels of the Brotherhood and forced to join in a rebellion. Caught between the threat of death and his suspicions that all is not what it seems, he must try to keep his friends alive and escape. Now this is something I find almost impossible to do. Somewhere through that process I actually get a buzz – usually when I forget to think critically at all. It seems that I have no capacity for objectivity. When I look at the work that I have done I see the prose through a microscope (showing ugliness usually) and the story from a lightyear away – focused on the shape of the whole thing and its various subplots. Getting critique is one way to get feedback. Reviews on published work are another. I’m not sure which one is crueler, probably the reviews since they are public and liable to effect sales. On a day-to-day basis, how are you supposed to get any sort of handle on your work? I guess writing is a never-ending series of judgements you make – is the sentence too long, is there enough description, should the clown really kill the president, how big are his shoes etc. Yet when the high of actually being in the flow fades, all I am left with is a sense of unease. How do you go about judging your own work as you progress? Is it actually impossible? Is There a Role for Passive Text? Talking about writing rules, one of the first that got drummed into me (actually, more like beaten into me — around the head with what was left of my frayed manuscript) was the importance of active writing; making the prose immediate, rather than passive. The shorthand for this is ‘Show don’t Tell’. You could do a lot worse than plough through your manuscript with this mantra repeating in your head. Certainly for action, it’s an absolute must. But it really got me wondering — is this really universally applicable? Some of the books I admired most as a young reader, such as Lord of the Rings, were full of passive text. Huge wads of backstory and enormously long sentences that would never get past a modern editor. Yet it worked. Another book I admire tremendously is Empire of the East by Fred Saberhagen. Accustomed to more modern prose, the passive style put me off initially, but it did not take me long (about two pages), to get sucked right in. That book is an absolute classic. I guess one of the things that is really attractive about passive prose (often combined with an omniscient PoV) is that it has a sort of reflective power, enabling a deeper level of insight to be injected into the work — be it on the level of character or life, the universe and everything. That sort of thing is difficult with strictly ‘active’ prose. Often tongue and cheek humor also works best in a passive mode (outside of dialogue that is). I think this is one of the things that I tried to emulate in my first attempts to write fantasy, which in my case came off as excessive backstory with overly grandiose metaphors (hey – don’t say anything about PoV!). The other thing about active prose is that is takes space. I often wonder if there is a case for a blend of active and passive prose, just for the sake of economy. 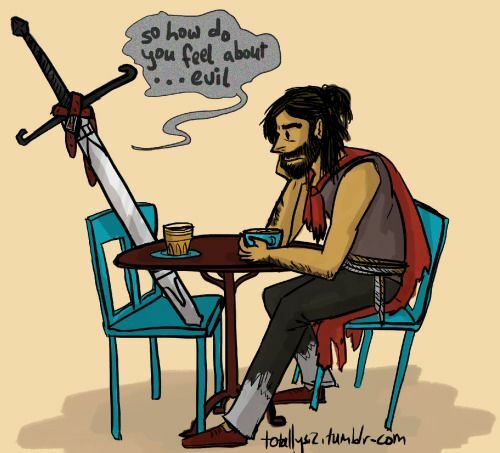 Its a lot faster to say ‘Joe survived the battle, running from the fiends of the Hegemon with his sword between his legs,’ than to go through the whole scene recounting every shiver of fear and blood-filled drop of sweat. If the scene is not really that crucial to the story, but merely a bridge, does it really matter? Is just makes me wonder. Is passive text total taboo, or is it just one more tool, and perhaps a valid one in some cases? Is building sympathy for your character the key to hooking a reader? Beginnings – and hooking the reader – have always been my bugbear. Big complex plots, interweaving stories, multiple characters, action scenes – no problem. Getting someone to read the story in the first place – Big Problem. The difficulty is that what one reader responds to in a character is often vastly different to another – in fact often diametrically opposed. One reader’s cool detached hero is another’s arrogant, insufferable narcissist. I used to come home from critique groups puzzled by contradictory comments that made little sense until the penny finally dropped. If people don’t like your characters, they will just not gel with your story. Once you reach that stage the critter will start (often unconsciously) working overtime to find all the things ‘wrong’ with your piece, when the real problem is that it simply has no resonance for them. They will talk vehemently about the punctuation on p3, or how they got mixed up in the dialogue, the logic error in par 5, or yada yada, yada… The same thing happens with editors. The reasons they give for rejecting your manuscript may have little to do with the real reason, which may be that they struggled to emotionally connect with the character. 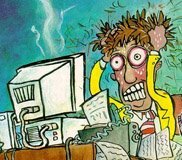 Even very successful writers don’t seem to have real control over reader’s reactions. One of David Gemmell readers all time favorite characters is Waylander. David Gemmell himself set out to make this guy a real piece of work – a nasty customer that no one should like; a ruthless assassin that kills without a thought. The surprise was that people loved Waylander, and he went on to be one of Gemmell’s most successful characters, extending over three books and carrying the story well in each one. So why did people respond to Waylander? Was there something unconsciously carried through from Gemmell about that character’s destiny that altered his portrayal? Or do people just love the bad guy – the old Sympathy for the Devil chestnut? What really draws you into a character? Their sense of connection – the way they love someone else or show they care? Being the underdog? Strength? Courage? Determination? Their vulnerability? Their sheer undead coolness? Or is it something less tangible than that. Is it being able to relate to the ordinary troubles and mundane problems that you share with the character i.e. they may be an immortal space traveller, but they still get parking tickets at the spaceport? Got any clues to share on building emotional resonance and sympathy for character? Writing near-future SF or Fantasy can be a nerve-wracking experience. How do you portray your world in such a way that it seems futuristic and unique, but without falling into the bear-trap of predicting the wrong trends? In some senses, it’s impossible to avoid. Particularly if the story itself is driven by a unique SF idea that requires a pretty specific type of setting. This makes it virtually impossible to avoid sketching a world that will not look like reality when it arrives. If you are too true to real-world predictions, the setting will look boring. The pace of technological advancement rarely matches the rate at which a writer’s imagination can move (you only have to look at any Golden Age SF story to realise we should all be using rocket-packs and flying cars to get to work by now. OK, communication technology was the exception.). If you try to be too realistic, you are also in danger – paradoxically – of looking like you don’t understand technology or science. ‘What? He doesn’t even have wormholes?’ I find this a tricky balance. The engineer and futurist in me wants to sketch something that I believe is realistic in time-frame, but I am forced to go beyond this or risk my SF credibility in the eyes of editors and readers. The best way to future-proof the fiction is to ensure that the story stands on its merits without the SF&F elements. The best SF stories of the Golden Age were driven as much by a true rendering of human emotions and drives as they were by their futuristic SF predictions. The key dilemma may have arisen due to technology (e.g. robots Vs humans), but the motivations of the characters and the situations they found themselves in still had a strong echo in the human condition and the everyday experience of being human. In my SF story The Buggy Plague, which was set on Mars, I thought I was out there talking about computer drives with terabytes of data storage. That was a little more than a decade ago and we are already there and beyond. Yet hopefully the core story – where an archaeologist tries to stay alive on a planet where man’s own technology has taken on a sentience and will of its own (and avoid a murderer) – still stands up. Of course it’s far easier to set the story way, way into the future. That way you can be extreme in the technological changes without ever getting caught out (mind you if you are still being read in 2758 I’d take that as a win anyway). Compare that to writing a few decades into the future. Sketching out something like David Brin’s Earth, set fifty years in the future, would involve far more detailed research into trends in technology, energy use etc. Another way to escape the problem is to make the timeline obscure. You can portray familiar technological elements, with some new twists, yet never spell out the actual date. Just include enough familiar setting elements to bridge to the present. The story can be set on another planet similar to Earth, where there is the implication is that the technology has been rediscovered, yet perhaps expressed and developed along slightly different lines. This allows the familiar to be placed alongside the new without direct comparison by the scrutinising reader. The approach that probably trumps them all is to make it clear at the outset that we are dealing with an alternate timeline. One off-hand comment about the Chinese colonies in the New World in the fifteenth century places the story firmly in the nether-zone. From there you can put together just about any sort of technological mix without going off the rails. This also allows you to explicitly give the dates. You can present the world as a direct analogue to current society, without having to worry about getting the technological development wrong. I would have to say I don’t like using this. I tend to be a purist in this way – I like to try and predict our future. But that’s a tough game to play. So how do you future-proof your fiction? Or do you just follow the story where it leads? Thinking back over the years I’ve been pounding away at the keyboard (at the beginning I actually typed stories on Dad’s old police-issue Remington. It wasn’t pretty), got me thinking about moments of key realisation in the writing craft. I guess for me the first one of these points would have to be understanding the need for true inventiveness. As for most writers, when I started off I wanted to recreate what I loved in fiction. In this case, sword-and-sorcery in a fairly familiar fantasy setting. My first ‘aha’ – triggered by the advice of a more experienced writer – was understanding the need to be original in the worlds I created. That more than anything shaped my later work. Following that was less of an ‘aha’ I suppose than a gradual understanding of point of view. Again, like most newbies, there was plenty of head-hopping in my early efforts, although to be fair this was more common in the sort of work that was inspiring me than what is on the shelves these days. Then the sinking realisation that being as good as what has gone before is not good enough – the writing craft moves on. Next was probably the daunting realisation that just because I was feeling something when I wrote and/or re-read a particular passage of my own work did not mean anyone else would. That opened up a whole issue of writing craft – kind of like realising the solid bridge you were standing on was really a tightrope over an abyss. Evoking something in a reader’s mind was a lot harder than I thought. There were plenty of others: active Vs passive, ‘show don’t tell’ , ‘direct’ experience through the use of physical sensations in a character, the ever-present struggle to create emotional resonance in the reader. What were your ‘aha’ moments? Ok, for a start it’s not really possible to edit a manuscript an infinite ‘n’ number of times. Sooner or later you have to let the Ugly Baby out into the world. As the old saying goes, “art is never completed, only abandoned”. I’ve just put the finishing touches to my Urban Fantasy Distant Shore (which was the book I spruiked in my ‘Next Big Thing’). My last monumental push was inspired by the deadline for the Queensland Literary Awards, Unpublished Manuscript Award. The competition is always tough, especially for quirky genre works like mine, but it was worth it to support the QLA and to give myself that last bit of motivation to get the thing up to scratch. Right now I’m drained. I’ve really put everything into doing the final redrafts on this one. Every damn trick I know is in this baby. Not only that, I’ve pushed myself up that sticky slope of manuscript improvement further than ever before. The problem is, it’s not enough to just have a good manuscript. It’s got to be best you can do and then some. For me, this meant getting that extra – uncomfortable – brutally honest feedback. Then working to clarify and streamline the prose. Working on word choice – trying to get that perfect verb. As well as all the usual stuff, like eliminating passive voice, using physical responses and sensations in the character to make the experience more direct. Regulating and mixing up sentence length. Over 96,000 words, that’s a lot of work. Then after all that, I read the work out loud to myself to check the flow and to eliminate those last errors. You can believe I lost my voice over those two days! What do you focus on when you enter the Nth circle of editing Hell? OK, this is geek time now. What are some of the choices in creating magic systems in fantasy? For originality, Steven Erikson’s idea of the Warrens was really something different. I enjoyed his Malazan books of the fallen, but they eventually got a little bogged down in the storyline, or maybe the characters didn’t grab me as much as some of the earlier novels (Gardens of the Moon is a classic). The originality in the magic did not abate though. As much as I liked David Gemmell, his magic was pretty straightforward and fairly familiar from the SFF spectrum. I guess as fundamental distinctions go, one of the most basic is Innate Magic Vs Learned Magic. For example in the Earthsea books, or Wheel of Time series, the talent was there from birth, whereas in other books – I think one of the Lawrence Watt-Evans’s books comes to mind – it is a skill that can be learned, a bit like learning what needs to go into a science experiment in our world to make it work according to our physical laws. I remember a great little scene (not sure what book this was from) – this skinny, white-bearded, yet very fit Mage, pounding away with his feet on some sort of platform to generate the energy for his spell. The idea here was a sort of conservation of energy, where the Mage had to first generate the energy with his own sweat before he did the spell. That was kind of neat. He also got to burn off lots of calories. You can have a blend as well. In my fantasy novel The Calvanni, there are innate magic-users (Sorcerers) who are quite powerful, yet rare, while most others can be trained in other less powerful forms of magic (Druids, Priests and Priestesses). The premise was that the Sorcerers came to dominate their world and formed a magic-using nobility. The power in the upper classes – feared and hated by many – waned over time and the Druids took control, forcing a purge of the now ‘evil’ Sorcerers and monopolizing magic. Another fundamental distinction is just how Powerful is Powerful? Is the pinnacle of magic the ability to obtain a vision, or perhaps influence a person’s thoughts – as in shamanism – or can an ‘Adept’ wipe out armies with the wave of a hand (Pug from Fiest comes to mind)? I think some books take the ultimate power of the Mage way too far. I like it better when the magic-user is limited, and has to pay for the use of his power. What magic systems from fantasy literature take your fancy? Running late today – getting an internet connection has been a little tricky. Of course I am completely relaxed. BTW do you like my new profile shot to the left there? I was thinking about writing craft and how as writers we gradually extend our skills and accumulate bits and pieces of knowledge. Anything of worth seems to come pretty hard indeed. The question I was asking myself was – what is the single best Gem I have learned? It’s a hard question to answer, and probably impossible because everything in writing seems to be interrelated. The knowledge and realisations that will enhance one person’s writing may be unhelpful for another. Each writer approaches their work from a unique perspective. Each will do some things instinctively, struggle with others and have unique blind spots. After a bit of consideration, I decided that just going chronologically would be the easiest approach. For me, the first Gem was understanding the importance of plot. My first novel draft was written off the cuff with just the smell of a story. That was fun, but it quickly derailed into a mess that was going nowhere. I binned it. After that I spent more than four months writing out (by hand) a sketch for every single scene, right down to key pieces of dialogue and movement. This enabled me to play with subplots and get a sense for overall arcs. I don’t go to that level of detail anymore, but I do plan the whole story by chapter and scene. After that, the biggest penny drop was at a short workshop on story writing. The presenter outlined a simple framework of three interrelated elements: CHARACTER, SETTING, CONFLICT. That really enhanced my writing, particularly short story writing. I think this was when I realised that Setting has to be integral to the story – so integral that the setting cannot be removed from the story. The acid test being that if the setting element can be removed from the story then it is not supporting it – a capital crime for a short story where every element must pull its weight. Then – and this was derived after a long, slow slog, rather than a lightbulb moment – I understood the role of point of view. Over a long period of time I learned to control it and use it. I learned to convey what a character was thinking from another character’s PoV through gestures, hesitations and leading dialogue. I have increased my understanding of creating both emotional resonance and character sympathy – hook – but I think I’m in for a long haul before I have the mastery I need. This is what I really want to understand right now. What are your greatest Gems? What do you want to learn next? Better still – what are your killer tips on creating emotional resonance and hooking a reader?